I worked with Gabrielle and she was amazing at staying in contact with me and making appropriate changes until I was fully happy with my purchase and personalization. The item came shipped in excellent condition with understandable instructions of keeping it in good condition. The ketubah came and looked as good as it did in the picture when purchasing and is great size. It was a very enjoyable experience and I would recommend using Gabrielle. Gabrielle - Thank you for designing Justin and my beautiful Ketubah. I can't believe in less than two months I will be married to the love of my life. Your art is the most important part of our union, and I feel so touched to have your attention to detail. Thank you! Finding out that we needed a ketubah was a little intimidating, as we had never witnessed anyone else get married in our way of life. I began to search online, but could not find a ketubah that fit our hearts for marriage, nor our budget. I came across Gabrielle's site and thought it was too good to be true. I sent Gabrielle a message, expecting to get a response the next day. She responded to me very quickly. From that moment until after she shipped our ketubah, Gabrielle thoroughly communicated with me. She was able to answer every question I had. I could not have asked for a more professional, personable, and detail oriented artist and business woman. We have had very heavy rain and thunderstorms; however, our ketubah arrived untouched and in very secure packaging. I felt like Gabrielle cared about our ketubah as much as we did. Now, we are able to get married, and have a beautiful, artistic, and valid document that reflects our hearts toward each other... All because of Gabrielle! We cannot thank Gabrielle enough! Our ketubah is beautiful and we couldn't be happier! There's so much detail and the colors are very rich. This is definitely a piece of artwork that we look forward to hanging in our home. Hi Gabrielle: The ketubah has arrived and it is absolutely stunning! We are very happy to have this piece of art as a lasting symbol of our union, and we have found the perfect place to hang it in our home after the wedding. We will be sure to send you a picture of us signing it at the ceremony. It has been such a pleasure to work with you. You answered all of our questions, and responded so quickly each time we contacted you. Further, it gave us peace of mind when you contacted our rabbi to verify the details. We definitely would recommend 3DKetubahs to anyone who is looking for one. Also, we appreciate the detailed instructions for the signing, and the care. Thanks so much! Gabrielle, We received the Ketubah today in perfect condition. We are blown away by the stunning detail and design of this piece of art. The beauty and the depth of the dimensions is vastly superior than what can be captured in a photograph. Thank you for taking the time to customize and verify language in our Ketubah as it came together. We appreciate you working with us and our Rabbi to ensure our satisfaction. You made this entire process easy and stress-free, and in the midst of planning a wedding, we cannot thank you enough for that. 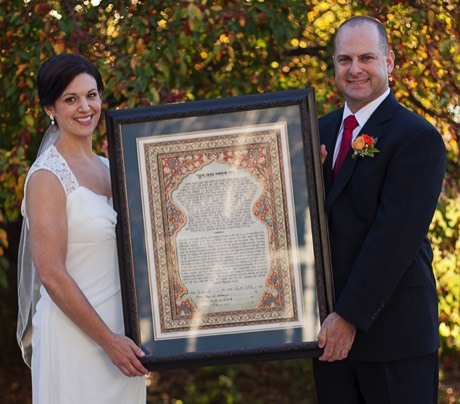 We love the Ketubah and will recommend your products to everyone we know. I would be honored if you choose to add this testimonial to your website. 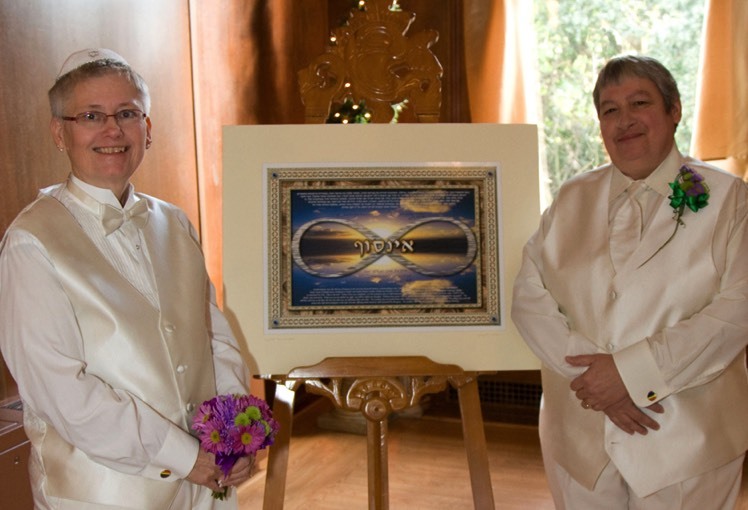 I will also send you a picture of us with the Ketubah on our wedding day. When we first started looking at ketubot, it was difficult to find one that we felt was "us". They were beautiful, sure, but none captured our personality. Then we came across Gabrielle's site. 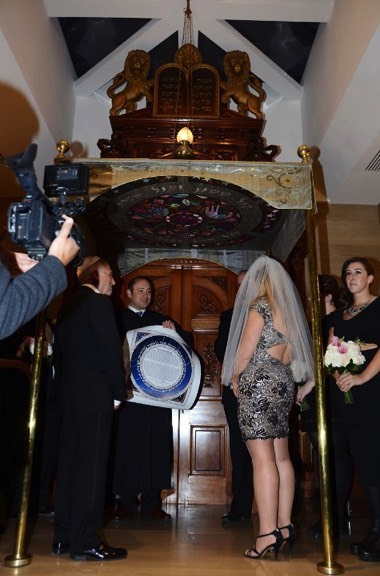 We knew from the moment we laid eyes on "Starlight I" that we had found our ketubah! It was almost like it was made just for us! Working with Gabrielle was a pleasure. She was very patient as we had many back and forth discussions with our rabbi about exactly what terminology needed to be used. She contacted our rabbi herself (with our permission) when needed. She even caught something we missed and corrected it! She was also able to make one small change to the layout to incorporate a request we had. 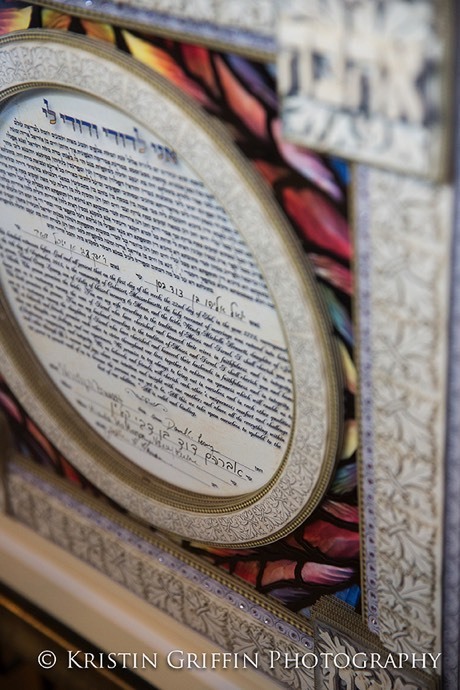 We anxiously awaited the arrival of the ketubah, and when it arrived, we were simply speechless at the work of art before us. It was even more stunning in person than we could have imagined. It even led the bride to tears! (They were good, we promise.) The day of the wedding, our ketubah brought many compliments from the guests, who not only said it was stunning, beautiful, and unique, but that it suited us perfectly. It is the perfect representation of us on our perfect wedding day, and we are very pleased. Thank you, Gabrielle, for adding something to our wedding that made it all the more special for us! Thank you for your fast service! You have been an example of the best possible service and responsiveness throughout our dealings for our wedding. We are thankful for your promptness, support and overall exceptional customer service. Dan and I can't wait to show off our Ketubah at our wedding! 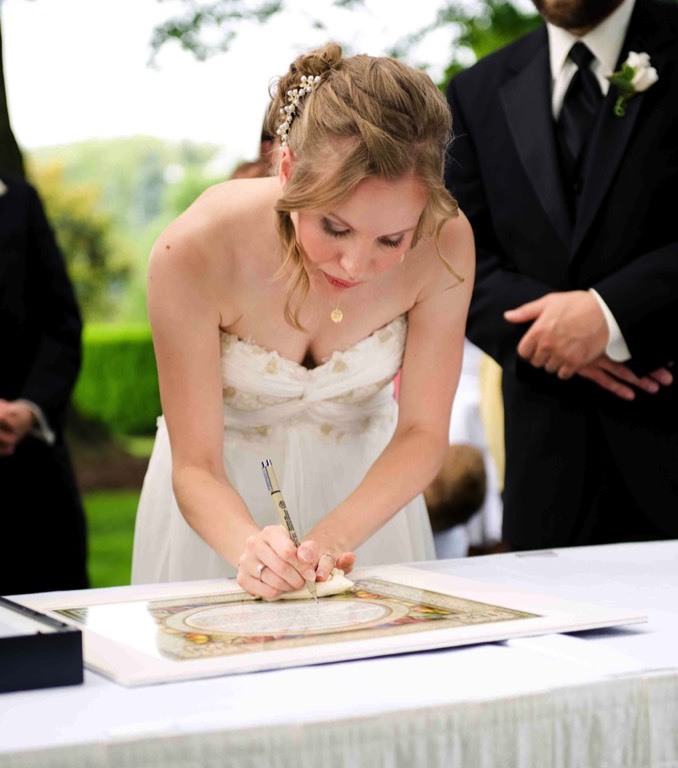 I can't recommend enough ordering a ketubah from Gabrielle! Not only is her artwork both gorgeous and reasonably priced compared to other ketubahs we found online, but she has done her best to help us at every stage of the process: answering questions quickly and clearly, providing clear ordering directions, allowing us to choose both our desired text and all of the personal details we wanted filled in, and then checking and double-checking all of the final details with both us and our rabbi multiple times until everything was just perfect. I just feel bad that I was usually the one holding up the correspondence - never Gabrielle! 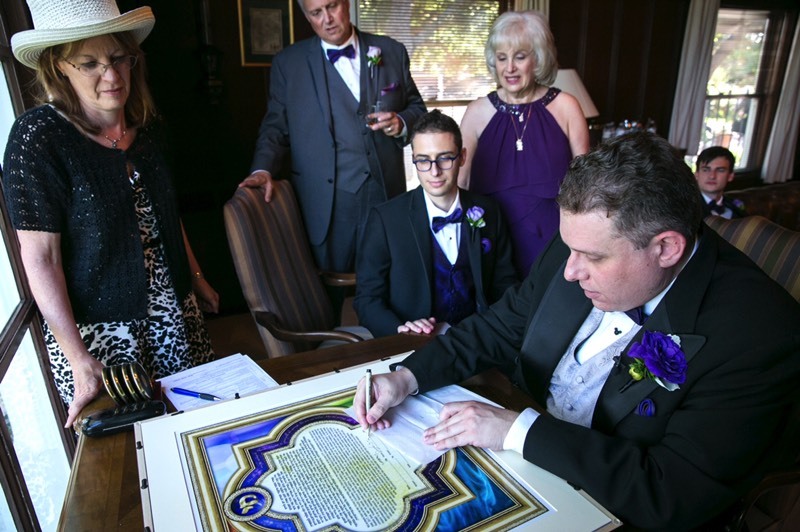 Once all the details were set, the ketubah was shipped off quickly and arrived in just a few days, together with an instruction sheet even detailing the right kind of pen for signing. 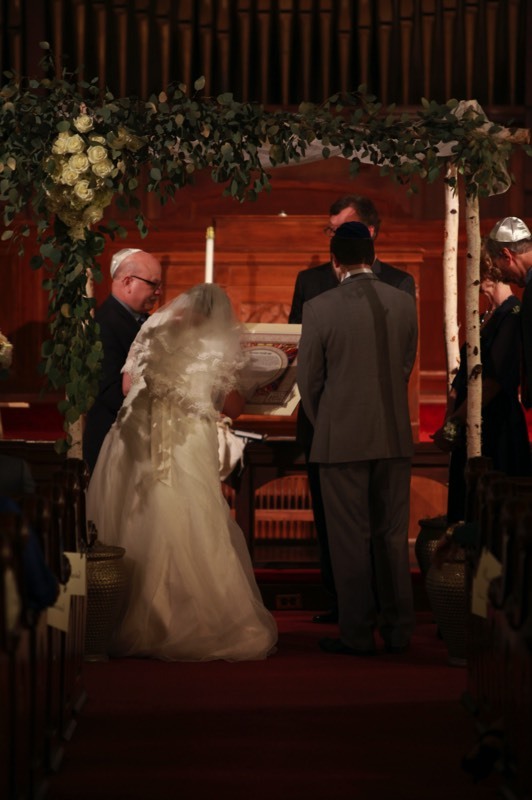 And Gabrielle was never anything other than courteous and caring that she get our ketubah just right for us. Even the rabbi went out of his way to tell us what a pleasure it was working with her! I looked at a lot of websites to find a unique art piece and was floored when I came across Gabrielle’s work. Ken and I chose the Starlight I ketuba with the Egalitatian III text. It was so poetic and suited us perfectly. Gabrielle was instantly in contact with me about our font options, creating a digital version and sending it to both me and the rabbi for proofing. Any alterations to the text I asked for, she made without issue. She was incredibly responsive throughout the entire process from selection to shipping, letting me know where she was in the process and sending me pictures to better understand how the ketuba was assembled. The ketuba is far more lovely in person than I imagined, and everyone at the wedding kept commenting how stunning and unique the piece is, that they’d never seen anything like it before. If you are like me and want something truly unique, Gabrielle is your artist. It was a real pleasure doing business with Gabrielle. She was incredibly professional, always available to answer questions and feedback (however small), and made the experience so pleasant and meaningful. She is thorough and pays attention to every detail. We especially appreciated her willingness to help us think through the customization process so that the ketubah would be truly one of a kind. We couldn't be happier with the result--it is gorgeous and so special, unlike anything we have ever seen and 100% what we wanted--from the English text, fonts, to the color of the stone embellishments. We also really appreciated having the chance to skype with Gabrielle so she could show us the 3D aspect and talk us through the uniqueness of her work, considering that this was a significant financial investment in the midst of so many costs associated with the wedding. It was well worth it--it says exactly what we want it to say and is a true piece of exquisite art to display in our home. We first saw Ashra 3D Art at our local Jewish art fair. When it came time to select a ketubah for our wedding, we shopped around but found nothing as beautiful or detailed as this line of artwork. The artist Gabrielle was very accommodating and worked with us every step of the way, even personally contacting our Rabbi. Our ketubah arrived perfectly wrapped and was even more splendid in person. My husband and I could not be happier with our choice and highly recommend Ashra Designs! 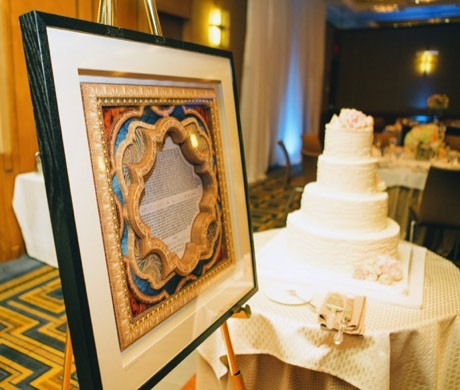 We couldn't be happier with our amazingly beautiful ketubah and the incredible ease of working with Gabrielle. We were completely clueless about the process of designing the ketubah, and Gabrielle walked us through every step, making it so easy to complete everything online and see digital proofs almost immediately so we'd know what we would be getting. 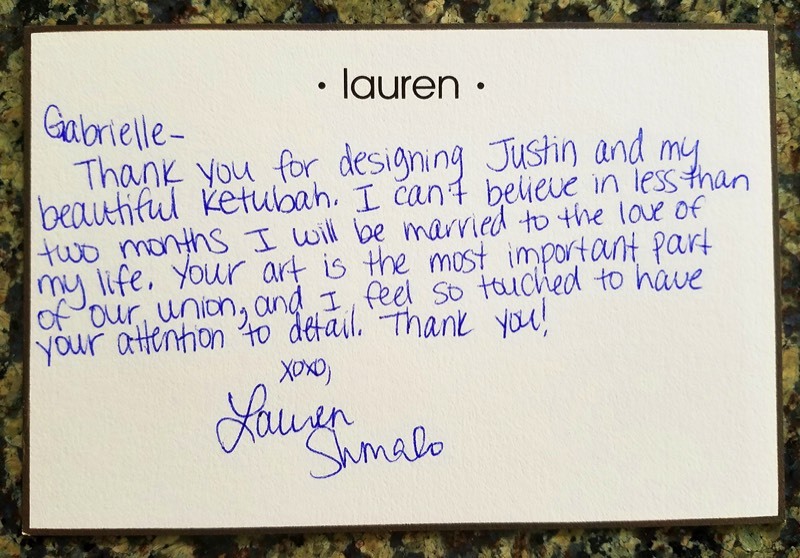 Combined with the lightning fast turnaround time and her great communication, Gabrielle made getting our ketubah one of the easiest parts of the entire wedding process! I can't recommend her enough for creating this incredibly important piece of art that symbolizes your love and commitment to one another. This ketubah is a marvelous representation of our marriage: both with a vibrant, carefully arranged collage reflecting the stained glass it portrays, as well as the poetic black-and-white language that showcases the merging of two souls into one married unit. Or more concisely put, this ketubah is resplendent! Gabrielle was an absolute pleasure to work with. 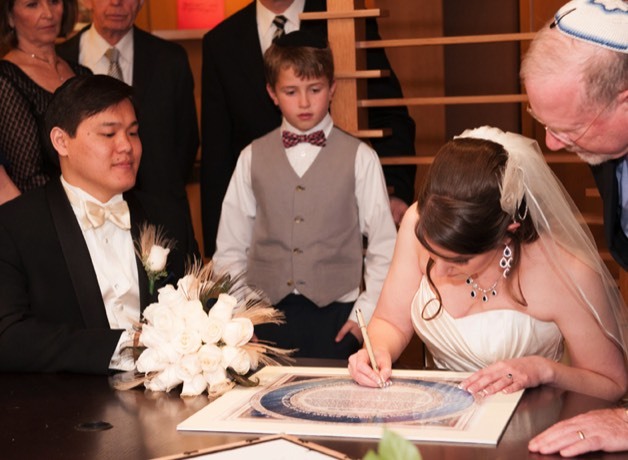 The ketubah came out beautifully, and Gabrielle was so helpful in putting it all together. We would highly recommend her to anybody, and we can’t wait to hang it up on our wall! This ketubah was amazing!! Very high quality and beautiful. I could not ask for a better product at any price. Additionally, Gabrielle was a dream to work with. Very friendly and professional-she got our ketubah to us with time to spare. Thank you for such a wonderful experience! Absolutely wonderful service! So pleased with everything from initial correspondence to unrolling it and seeing how beautiful it is! Thank you! 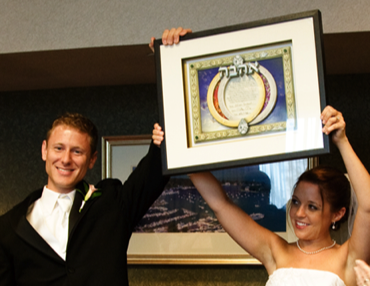 The ketubah is a beautiful way to commemorate the joining of two people and I wanted one that was personal and unique. Gabrielle demonstrated total commitment to outstanding customer service and looked for ways to improve products and experiences. 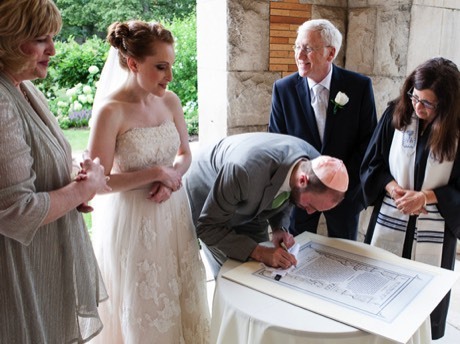 When I began searching for a ketubah, I wasn’t sure of the process or what to expect. Gabrielle exceeded my expectations by providing timely feedback and follow-up emails. She responded to all my inquiries in a timely, efficient, and friendly manner. She made this aspect of my wedding not only an easy task, but an enjoyable one! I was having some problems with my other vendors with incorrect contracts and unanswered emails. Gabrielle made me feel like I was a priority and she truly cared that I was happy with the product. It is evident that she values her customers and takes pride in her work. I also ordered a parents’ gift and was extremely happy with the results and found it to be a nice way to express gratitude and happiness. 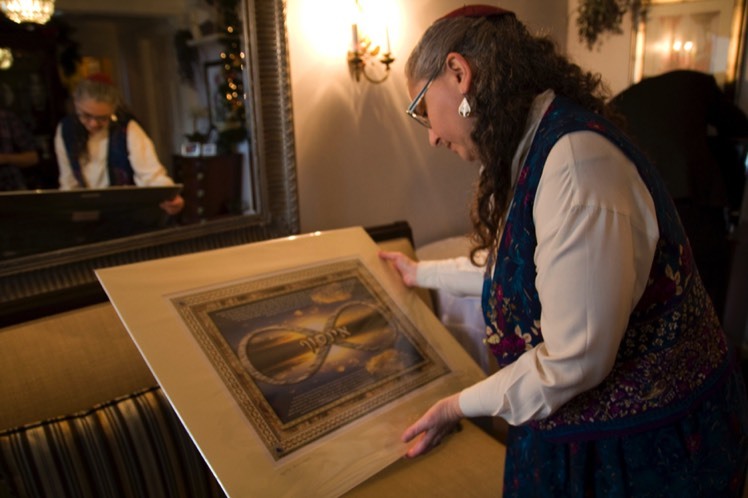 Her professional effort and inspired artistic conception and execution led to a ketubah that will be cherished forever. Gabrielle, Our ketubah arrived yesterday as promised! It is more beautiful than we dared to imagine! The words mean so much to us! We feel that they truly represent who we are as a couple and how we feel about each other. We will treasure it always and plan to hang it over our bed as a reminder each night of our commitment to each other. This process has been very easy, and we appreciate your flexibility and responsiveness while working with us! Again many thanks! 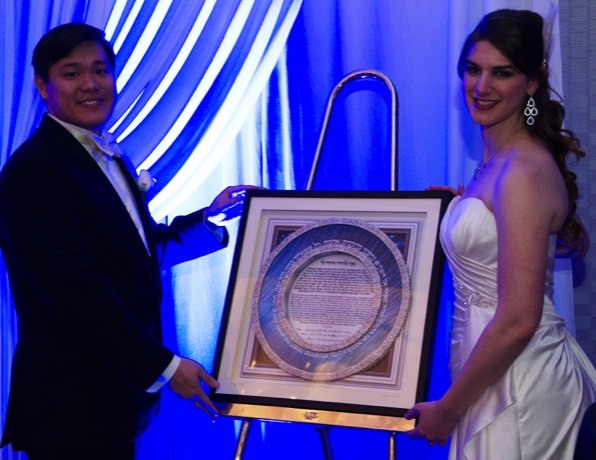 Gabrielle did a great job of making our personalized ketubah a piece of meaningful sacred art in time for our wedding! She communicated with our rabbi throughout the process and made sure every letter was right and had our approval before printing and sending. 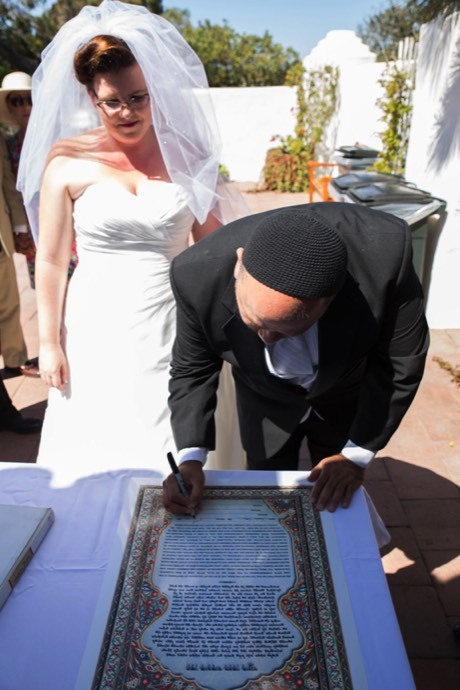 This was important to us because we wrote our own English vows and wanted to include them along with the more traditional Hebrew script. The print quality is excellent and we bought a temporary frame for the ceremony signing (with the intention of custom framing the piece with our civil license afterwards). 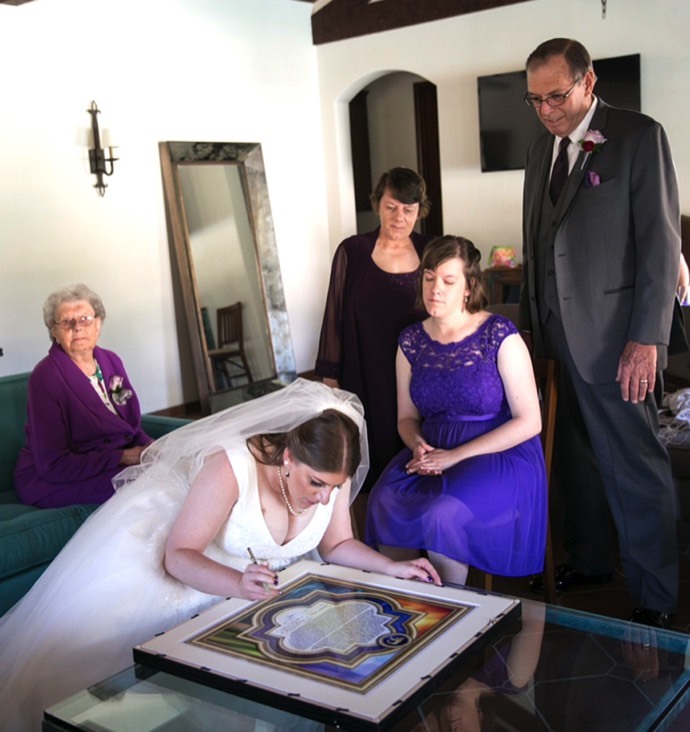 At the signing, even our family members were impressed with the ketubah's uniqueness. All in all, we couldn't be happier with how our marriage artifact turned out. It will be cherished and preserved for years to come! The ketubah Gabrielle helped us create was amazing, my partner is Jewish and I was clueless so after many many hours spent searching I found Gabrielle website. 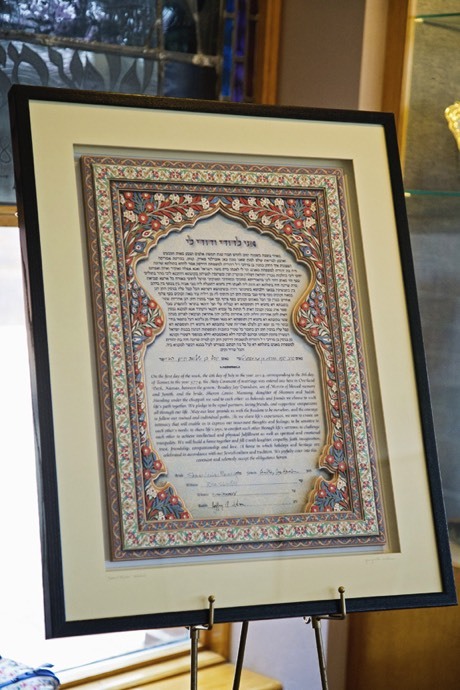 Wow we knew immediately we had right the place and had found perfect ketubah! I rush along and sent in my order. Gabrielle sent me a proof and OH NO! I ordered the wrong one. Panic stricken I placed a second ordered for the right one. Lucky for us Gabrielle knew something was not right! She worked with me diligently to understand what I wanted. She then refunded my money for the one ketubah and then created exactly the perfect one for us. Everyone at our wedding was amazed at how beautiful it was. If you are looking for a special ketubah then you should really allow a very special person to help you create it and Gabrielle is the best! 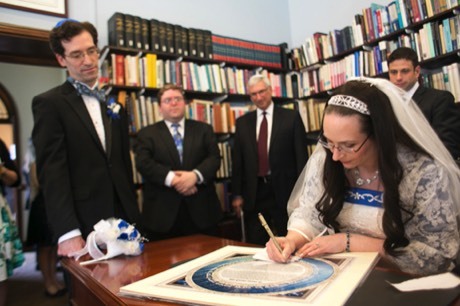 I would highly recommend her to anyone who is considering purchasing a ketubah. We met Gabrielle at the Jstyle Bridal Show at the Ritz Carlton in Cleveland several months before our wedding. We were impressed with her professionalism, kindness, frankness, and genuine desire to help us. 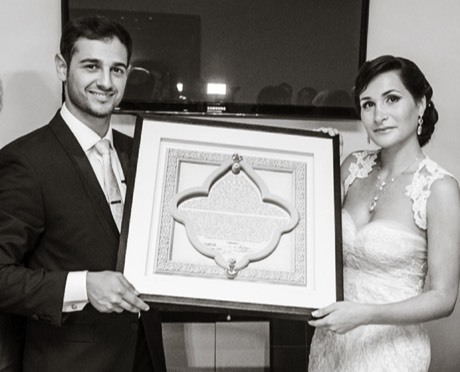 Her primary offering is 3D ketubahs and although we wanted one, we could not fit it into our wedding budget so Gabrielle worked with us to create a 2D ketubah that we could afford. 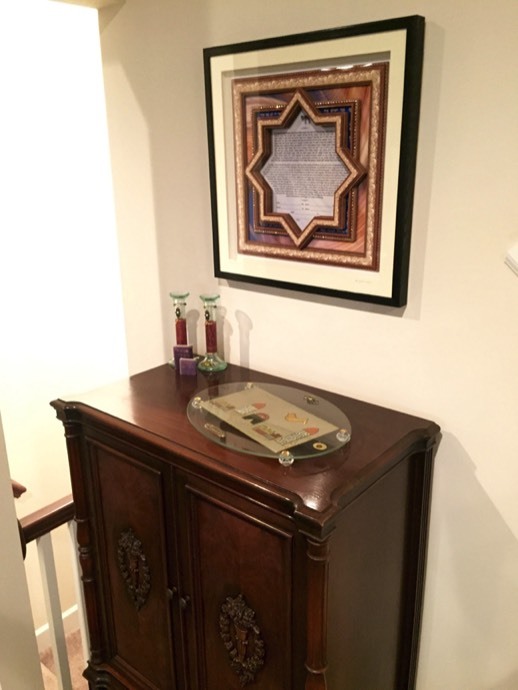 We were anxious about purchasing a large ketubah because we did not know how we would frame it, hang it, and display it! At first Gabrielle oferred a lot of ideas for where to get frames and glass and she was not pushy. We would have done everything ourselves but wedding stress was getting to us so Gabrielle oferred to look for frames online for us and purchase the UV glass and matting to go with it. Ultimately, we got the framed ketubah in the mail in one package and we didn't have to worry about anything other than getting our text approved by our Cantor! We would recommend Gabrielle to our friends and family! Gabrielle is a great artist, the 3D ketuba is absolutely beautiful and was delivered in time (...of our 10/1/13 deadline). She is a very kind person and communicated with us throughout the process. We thank her so much. We would recommend her. Great service! Absolutely love the ketubah! Everything is amazing! Would recommend to anyone! 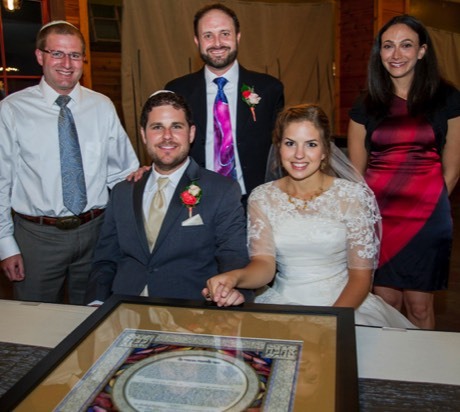 The ketubah is important to us since it will be hanging up in our home, symbolizing our marriage forever…. And we couldn't be happier with the outcome! Gabrielle is a true artist that pays attention to every detail. 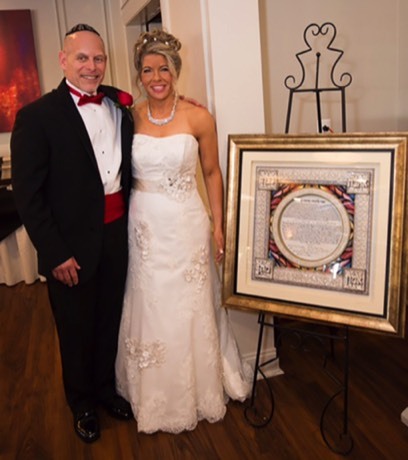 Our ketubah matches our wedding theme and us as a couple and our request of pearls instead of faux gems was easily accommodated by Gabrielle. The ketubah was delivered promptly and carefully sealed with detailed instructions which are very helpful. Gabrielle clearly communicated with us throughout the process, coordinating with our rabbi, and is still available for questions after the sale. Not only do you get a beautiful and unique product, but you get genuine, professional service. Thank you! We look forward to showcasing your masterpiece at the wedding and in our home. We love our high quality Ketubah!!! Gabrielle was very thorough and detailed around every step of the process. We would definitely recommend. My wife and I were married on January 4, 2013 and were blessed to find Gabrielle who is an amazing artist and loving soul. Our first contact with her was on December 8. 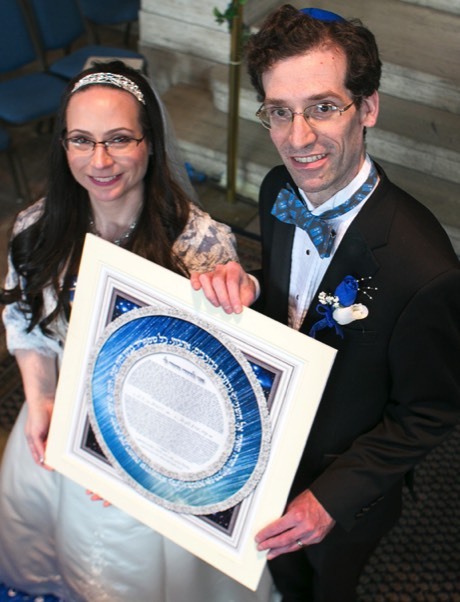 That gave us less than four weeks to get our Ketubah designed, created and shipped. Gabrielle communicated with us and with our Rabbi as if we were members of her family. In every communication she conveyed her excitement about being a part of this process with us. 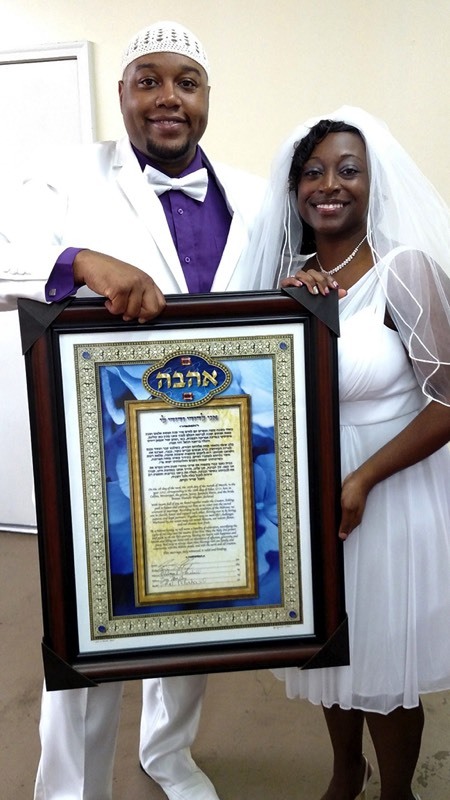 Because our marriage contract was created with our original wording, we needed Hebrew translation. Gabrielle located a translator whose work was quickly approved by our Rabbi. 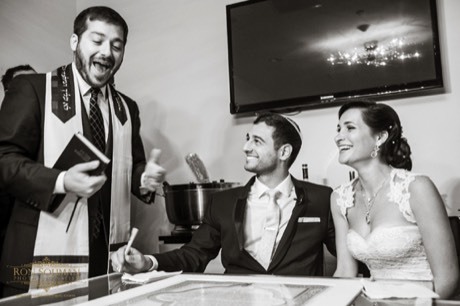 Her communications were lightning fast, the cost was reasonable and we received our breath-taking Ketubah in record time. Having our Ketubah on our wall will forever be enhanced by the wonderful memories of the personal way that Gabrielle collaborated with us. 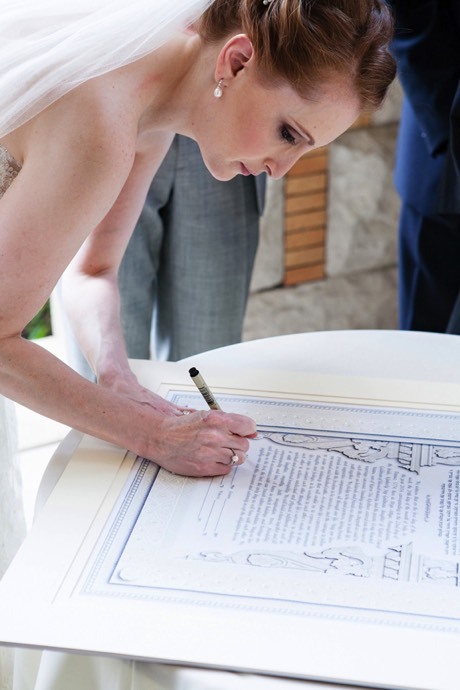 The ketubah Gabrielle helped us design was an incredibly beautiful addition to our wedding, and signing it was one of the most memorable parts of the day. 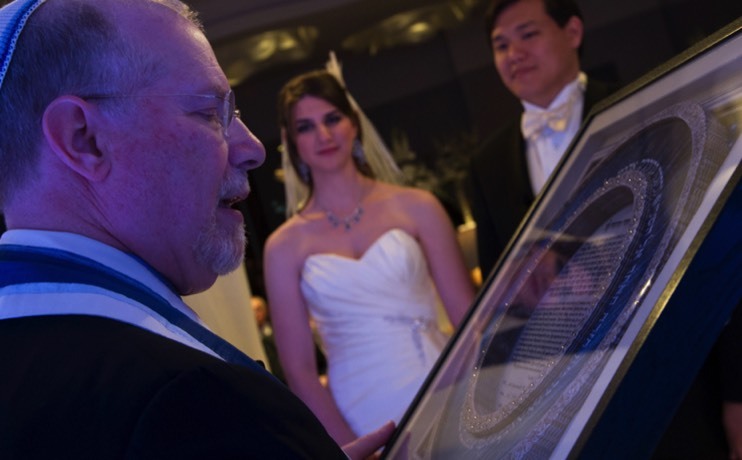 Our guests had never seen such a personalized and intricately detailed ketubah, and so it drew quite a crowd! Gabrielle led us through the process from start to finish, making it easy to find the perfect text and design to fit our life and love for each other. We are so happy to have this work of art in our home, as an inspiring symbol of our new family. Gabrielle, Again, can't thank you enough for all your work and efforts and those little extras. Thank you also for being one of the few Ketubah sites to allow custom texts! What a blessing!! 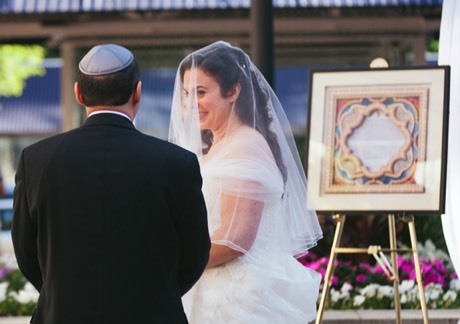 Just wanted to let you know that we got many oohs and ahhs over your gorgeous Ketubah design! We also passed your business information onto our Rabbi so he can offer your site as a resource to other couples in the future... Thank you again for all your help and effort to make this day all that it could and should be! I really appreciate that you were able to think outside the box and still get the ketubah to me. I can't thank you enough for that. It is stunningly beautiful! It's unique, intricate and modern yet still traditional... We are so impressed with the finished product. Your work is so intricate and beautiful, we cannot wait to hang it in our new home! And we cannot wait to share it with our friends and family at our wedding!! Thank you again for all of your beautiful work and your professionalism. I will sing your praises to everyone! ... I tried to convince Jason to hang it before the wedding because I feel terrible having to leave it in the box for another two months!! I know Im gushing -- but I honestly cannot thank you enough for making us such a stunning and meaningful piece of art. We are so excited about it. 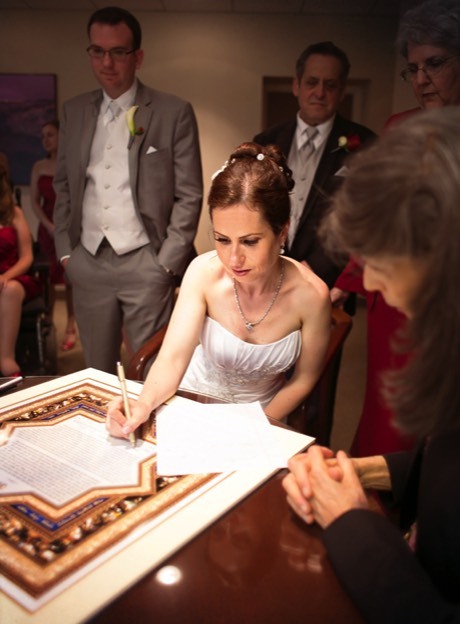 Gabrielle was extremely thorough and detailed in our interactions regarding our Ketubah. She was very quick and responsive in our communication and did more than expected to make sure we were satisfied with the Ketubah we ordered. Her designs are gorgeous and she clearly takes great pride in her work. I would highly recommend anyone to order from her as she is talented and wonderful to do business with. Thanks Gabrielle! Gabrielle made this experience very easy. Besides the fact that the ketubah is absolutely gorgeous, it was delivered to me in less than a week! I will definitely refer her to friends and family. I could not be happier! We couldn't be happier with the ketubah that Gabrielle designed for us. Our wedding guests were in awe of the originality of such a traditional ceremonial piece. Gabrielle paid great attention to our interests and likes as she chose visual graphics, quotes and colors that represent us as a couple. We are thrilled with our choice! It is more than a pleasure for me to share that I had such a wonderful, positive experience working with Gabrielle of Ashra Designs. Thank you so much for the efficient timing, attention to detail, care and concern to personalization. We love our ketubah! We love our ketubah! Gabrielle has done an amazing job! She was patient and answered all of our questions!! It was such a seamless task, all thanks to Gabrielle at Ashra Designs. A grand thank you! Thank you very much for your beautiful artwork! 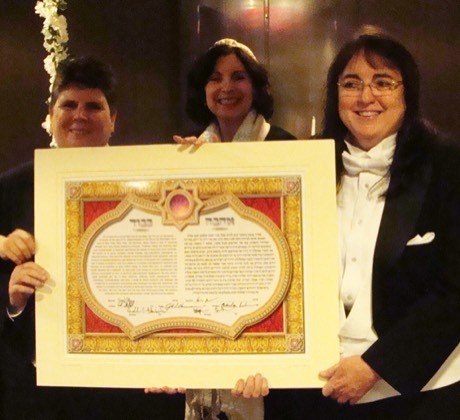 We love our ketubah! It was a pleasure working with you! Thank you for the personalization of our text and all your extra attention to detail! Gabrielle from Ashra Designs has been a pleasure to work with helping us with our ketubah. Her collection of ketubahs is fabulous and she can also customize anything you'd like (text, quotes, or personalization). She was able to get a proof and sample of what the ketubah looked like and we were extremely satisfied. I would definitely recommend working with her. I just received my ketubah and it looks beautiful! Even nicer than I expected and I had high expectations! The matting is done perfectly! Well worth the price. No stress dealing with Gabrielle for the order either, and I also love the fact that it is signed. Thank you Gabrielle! Working with Gabrielle of Ashra Designs was one of the most pleasant aspects of my wedding planning. I found my ketubah design on the user friendly website. From there, I proceeded to contact Gabrielle with some specifications of the text that I wanted to be included. Gabrielle worked with me not only promptly, but with a genuine kindness that is a rare find. From edits and revisions to personal preferences, Gabrielle made herself available at all times. We were more than pleased with the finished product. The website images do little justice to the actual design itself. We were so grateful to have stumbled upon this site and so blessed to have had Gabrielle a part of our wedding process. 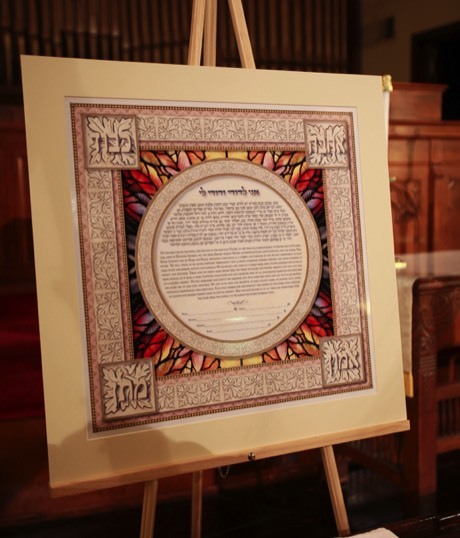 We truly cherish our ketubah created by Gabrielle Mizrachi-Mallin of Ashra Designs. She not only so eloquently captured the essence of our unique relationship, but was able to encapsulate it in one of the most beautiful and meaningful pieces of artwork that we own. We are so proud to display this intricate and breathtaking commemoration of our marriage in our home.